Gravity fed Water systems are still the most common water systems in the UK. When it comes to buying taps and showers you need to be aware of the pressure generated by your water system, all taps and showers will work on different minimum pressures which should be stated by the retailer or manufacturer. With all taps it is fairly straight forward if you buy the correct tap for your system then it should work well and you will be happy with the performance at the stated pressure. Working out how much pressure you have. 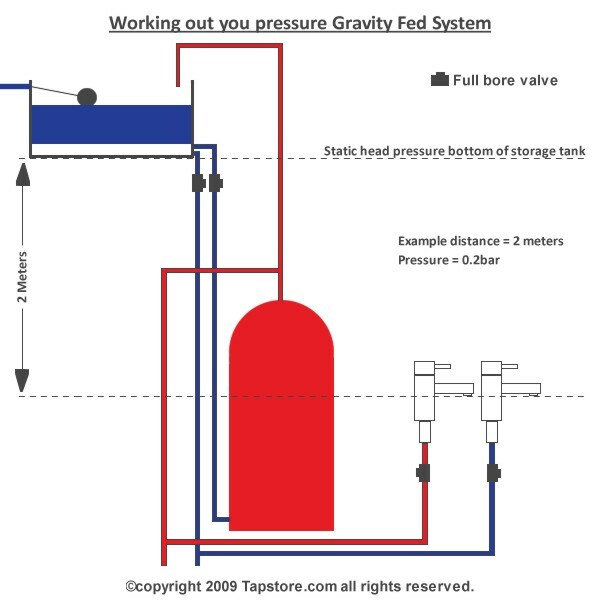 With gravity fed systems you do not need a plumber to tell you your pressure it is very simple to work this out for yourself, (see drawing) the pressure is generated from the stored cold water tank, technically the water line or level but we have to allow for the fact that the water level of the cold water storage tank is not always the same so for this reason we use the base of the water tank. So if you measure from the base of the cold water tank to the exact position of where the water is coming out from in a vertical measurement (if its a shower it will be to where the shower head is or if its a tap to where the spout of the tap finishes). For each meter in vertical distance you will have 0.1bar in pressure so if you select a kitchen tap that requires 0.5 bar pressure then you will need 5 meters in vertical distance, if you select a basin tap that requires 0.2bar then you will require 2 meters as you will see in the below drawing. A gravity fed water system does have lots of advantages over mains fed water systems. a, You will be storing water at the temperature that you require. b, You are not totally reliant on the mains pressure in your given area. c, You can have a flexible design to your water system and pump certain items to the required pressure and flow. d, There are many modern solar and ground source heat systems that will work with gravity fed systems.